So it’s been a while since our last post. For anyone following this page, well, i’m sure you’ve moved on. But guess what?? We’re back!! For how long you ask? Your guess is as good as ours. Well to get back in the swing of things, I’ll start out with the most recent video game experiences, which would have to be the new content in World of Warcraft. Patch 3.3 dropped this past Tuesday. Patch notes can be found here. Three new dungeons and a new raid have dropped with this patch, with the new raid eventually leading to a fight to end the Lich King once and for all (atleast until the raid reset). But we won’t even get to see the Lich King for quite some time, as Blizzard is to release new bosses in the raid periodically, with the next set of bosses to be released in a little less than one month. Also, if you haven’t played in a while, and wish to be a part of the the fal of the Lich King, gearing up for the new content is easy as pie with the new patch. So what are you waiting for??? Let’s see if I can keep up with posting entries on the site regularly again. Or even convince the other posters on the site to do the same. More to come in the next couple days. 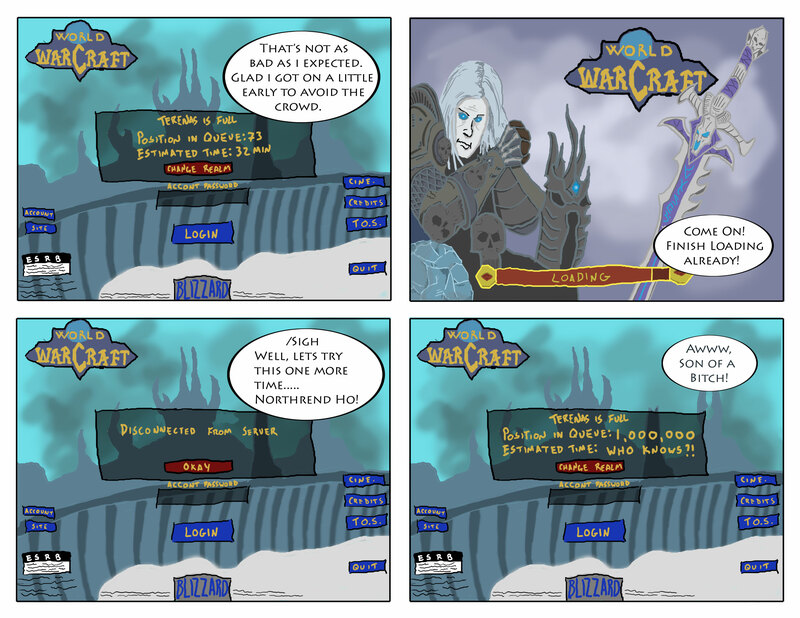 Pretty hilarious parody of birth and development of World of Warcraft…. This makes me want to hurt people! Being a WoW player, and a pretty dedicated one at that, I hate when the media portrays MMOs as life destroying digital demons. Not every person that plays them is a basement dwelling, pale skinned, no life failure. In fact there are some pretty succesful and popular WoW players. I could say a lot about this subject but lets save that for another day. This video right here might actually piss me off more than the afformentioned press exposure. Enjoy the cringe fest…. Ok. Now that you’ve seen the video…. If that dude was in my guild I would never let him live it down, haha.